The Crown Victoria Police Interceptor, specially designed for law enforcement, has a high-speed package containing a high performance engine with twin cam, multi-point injected V-8 and a high performance computer. The 4 speed electronic transmission has an extra capacity, limited slip and high ratio rear end. Ventilated rims on these police cars are one inch wider than standard to force air onto the breaks for cooling, which is essential for stopping power at high speeds. The suspension package has high performance front and rear sway bars with heavyweight suspension bushings. 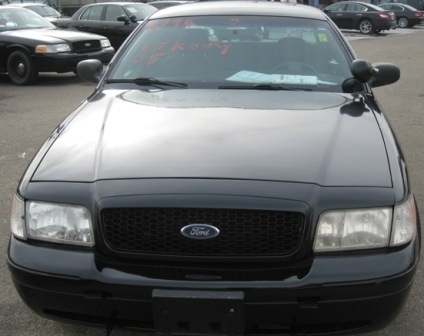 The P71 CVPI has NASCAR quality, fully adjustable front suspension that can be dialed in for high performance driving. Our retired police cruisers have 120 amp alternators and external, aircraft quality engine coolers, two transmission coolers, double fan radiator cooling system, and, of course, a heavy-duty radiator. Pre-sale vehicle servicing includes: engine fluids, spark plugs, wires; air filter, oil filter; high quality Valvoline VR1 oil, throttle body plate intake service and cleaning; engine and transmission mounts checked and/or replaced; transmission service, filter and gasket change and inspections, refilled with high quality Dextron3 fluid; limited slip rear end fluid replaced as required; break fluid flush and inspection with a high quality pad replacement; wheel and axel bearings inspected and serviced.